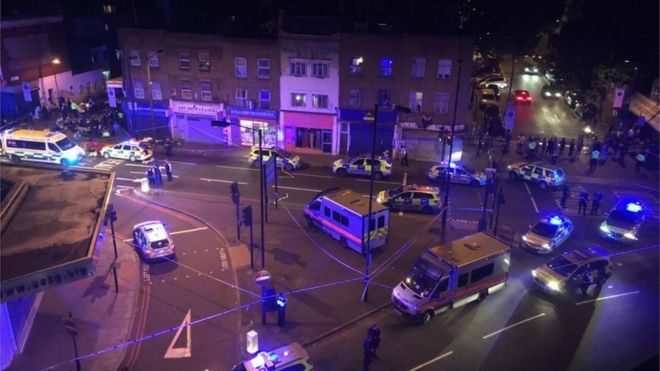 The Big Wobble: Terrorist attack in London, a ‘white man’ who screamed, ‘I want to kill all Muslims’ ploughed his van into worshipers outside of mosque in a new twist! Terrorist attack in London, a ‘white man’ who screamed, ‘I want to kill all Muslims’ ploughed his van into worshipers outside of mosque in a new twist! Another terrorist attack in London, a ‘white man’ who screamed, ‘I want to kill all Muslims’ ploughed his van into a group of worshipers outside a mosque in London, killing one and injuring many more, which is the worst case of Islamophobia in Britain so far. For the third time in three months, police are investigating a vehicle which has ploughed into innocent people going about their business, along with the Manchester bomb and horrific fire at the London tower block earlier this week, the UK has suffered a horrendous couple of months, with dark forces coming to the fore.